The first time I grilled these stuffed mushrooms, it was 10 degrees Fahrenheit outside, with a wind chill of minus 15 degrees... and snowing! 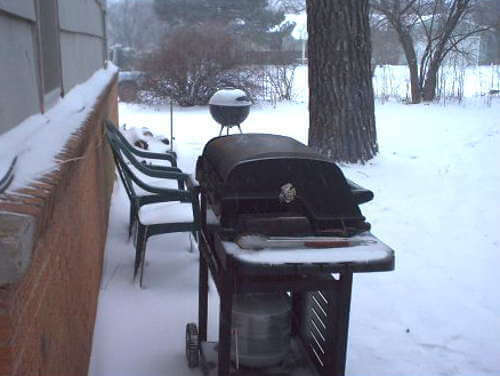 Great weather for firing up the gas grill. Perfect! These mushrooms are a great little appetizer to snack on before the meal begins. Grill up a couple batches and you'll never be lonely while tending the outdoor cooker. The filling includes corn meal muffin mix, which holds everything together and adds a nice sweetness to the final flavor. Use large white mushrooms or the brown Crimini mushrooms. Buy mushrooms that are all close to the same size so they're done grilling all at once. To prep the mushrooms, pop out the stems and scoop out the gills with a teaspoon. Poke a hole through the mushroom cap to let liquid drain as the mushrooms are grilling. Prep the mushrooms and chop the onions and crab meat. Prepare the muffin batter. Follow the muffin mix directions, but use half the amount of water called for to start. The batter needs to be on the thick side. Add a little more water if it seems too thick. 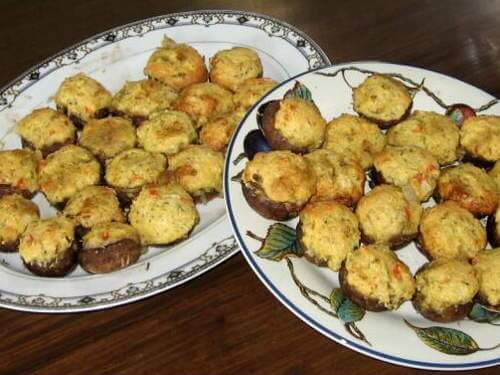 Stir the chopped onions and crab meat into the muffin batter. Lightly coat the mushrooms with oil, then shake on a bit of salt and pepper. 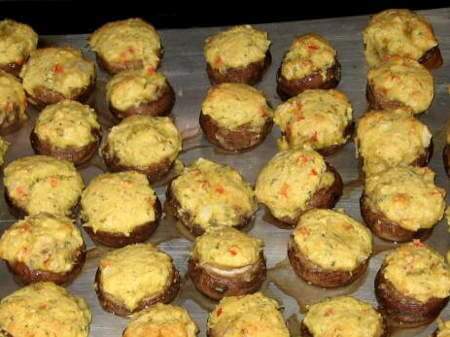 Fill each mushroom cap with a generous amount of stuffing. I like to sprinkle a little cayenne pepper on top of the stuffed mushrooms to give 'em a little kick. Grill the mushrooms using the indirect grilling method, in a covered grill for 15 to 20 minutes, or until the little muffin is done. Use your creativity with these and make substitutions or add new ingredients. Try chopped ham or smoked brisket instead of the crab meat. Add some chopped celery or garlic to the stuffing. Whatever you try, a batch of these mushrooms will be hard to beat.